sshhh... let's talk about a special dish, well maybe an unhealthy one... literally a heart stopping one (and Onie if you are reading this and think that I copied your words, yes I did) because there's no other way to describe this dish. Seriously now, I'm talking about a pork dish or "pulutan" (a Filipino term for an appetizer that usually goes with beer and drinking) previously seen in Anthony Bourdain's show featuring food from all over the Philippines. Bourdain enjoyed a few beers at the road side eatery where this dish was, if not created, at least perfected. It started in the central Luzon province of Pampanga and for us Filipinos, this mouth watering pork dish is called SISIG. At this point, I want to issue a warning: IF YOU FIND OFFALS DISGUSTING, STOP! SKIP THIS POST AND MOVE TO THE NEXT! You might find the ingredients too disgusting. But if you are Andrew Zimmerin-usque, adventerous and bold, continue reading it. 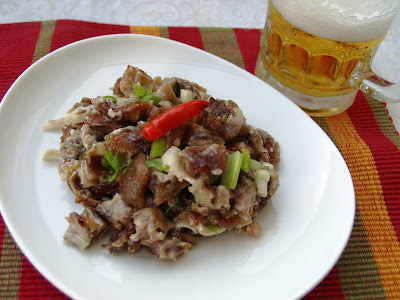 Yes Sisig is made of pig's offals: cheeks and ears. Preparing this dish takes three steps, or maybe four if you include stir frying on the hot plate when served. I rarely make sisig because: a) for its high cholesterol content (hence it's heart stopping classification), and b) it's tedious to make (as mentioned it takes 4 cooking processes plus the chopping). But how can I say no when I was requested to make it by my husband's youngest brother, Gerry. He just turned 27! (*wink wink I know huh, my husband stopped counting at age 27 too!) and he called to say he's celebrating his birthday here in San Diego, and yeah with a request that I make sisig. The first time I met Gerry was when he was 11 and I remember he had a naughty smile when he met me for the very first time as he was not used to seeing his Kuya (older brother) with a girlfriend. He had a cast on his arm due to a soccer injury and he asked me to sign it for him. When my husband and I got married, he would hang out with us in the basement, and yes he taught me how to play Mario Bros. on the Nintendo, back in the days. Two decades later, he still plays video games but now with his two cute little boys. didn't i tell you they're cute??? Being the youngest of five children, I guess it's what makes everybody loves Gerry. If there's a show called Everybody loves Raymond, we have "Everybody loves Gerry" (ask my mother in law; haha!) and it continues, more so now that he has his own family. We see him as such a doting father and a loving husband. In a stockpot, throw in some peppercorns, bay leaf, celery and 4 cups of water. Add the pig's cheek and ear. Let it boil until tender. Let it dry. Grill the pig's ear. I used George Foreman griller but if you grill it with charcoal it's a lot better. Now deep fry the pig's cheek until crispy. The crispy bits will give an interesting crunch to it as you take a bite. Chop them into uniformed slices. Mix the chopped onions, calamansi and season it with maggi seasoning. Add the mayo. Now on a stove top, heat an iron cast grill pan. Let the sisig sizzle before serving. Or you can use a cast iron serving plate. Serve it while it's still sizzling, include hot sauce (Mother's Best brand from the Philippines or Louisiana hot sauce) or tabasco sauce on the side. For sure it's the talk of the party... have fun! 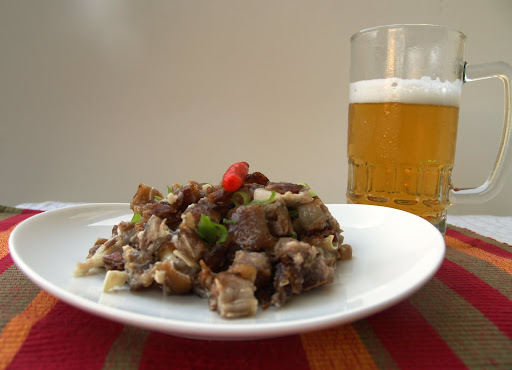 Cold beer plus sisig go perfectly together. The way I feel about offals is that so long as I don't actually know that I'm eating them, I'm fine with eating them. LOL. This dish does sound tasty though. And your brother-in-law sounds like a whole lot of fun! And Happy Birthday to Gerry! I don't mind to have this once in a while ;D Can I request too? Jenny, you're so right it goes well with cold beer, and best pulutan ever! TLS: I just realized that I kept writing TLC in all my replies for you instead of TLS hahaha.. how's it been over there in Japan? Joanne: The dish is tasty though, and I am an adventurous eater, but my problem is more on the health-wise. Tracey: Thanks! It was definitely tedious but it's all worth it, for the taste and for the company! Anncoo:yes moderation is key haha! sure I'd do it for you, anytime! Mmmm, love sisig! Don't have it often and I've never made it at home, but I have a soft spot for it and for pigs ears :) Yum! And yes, those boys are adorable! Liren: it comes as a surprise though to know that you guys enjoy it too... im glad im glad! Rebecca: we love having company too as much as they love coming here... and well SD is such a beautiful city to visit too so that's another plus. 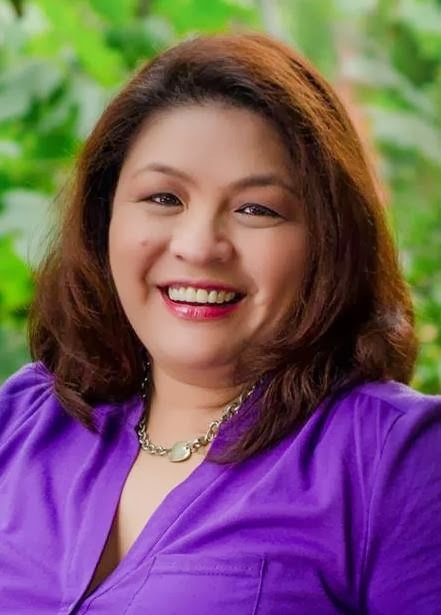 Hi Jean: I think Sisig was "developed" in the early 80's. Im not quite sure, that's maybethe reason why your dad may not be familiar with it. But yeah it's good with ice cold beer. One of my all-time favorites!! And it really is becoming the hottest breakout dish here in San Francisco -- among non-Filipinos. I love the crunch, the salt and the fat! Thanks for sharing the recipe, Malou. I's have to make my first sisig soon!! Jun: great to know that Sisig is creating a buzz over there in San Fran, and pleasantly surprised that even Non-Filipinos like them too. Mary:: thanks, and yeah I had a great day today, I sure hope all is well with you too. Cheers! I have never had sisig. So intrigued how it's going to taste! Handsome boys :D Lots of girls will be drawn to them :P My mom would love this offal dish.....her favourite. I have not eaten it for a long time so I think I have lost interest. But I guess once I sink my teeth into it, I will start liking it all over again...haha. We ate lots when we were young. Those days....nothing was wasted if you know what I mean. Hope you have a wonderful day. That looks awesome! I posted a while ago about eating fried rice for breakfast in Thailand. I still crave it after so many years!